With recreation, nightlife, sports, food, art, walkable neighborhoods and short commutes, Chicago is a beacon in the Midwest. 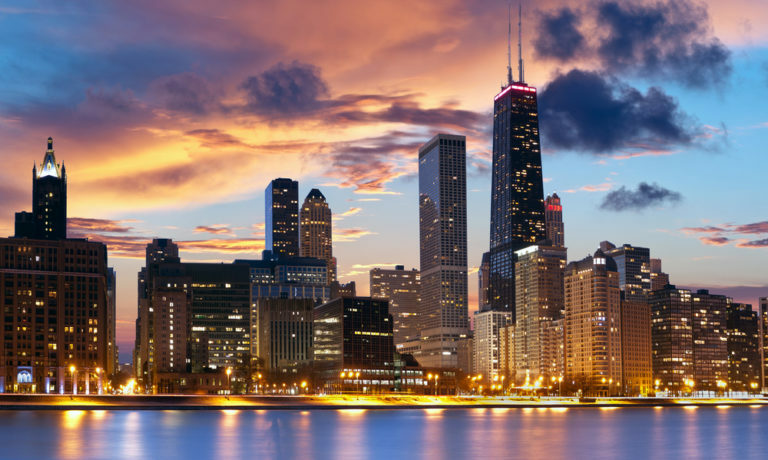 Find out how much it costs to live in Chicago and how to jump-start your apartment search to get a pad with your top desired amenities in a neighborhood you love to call home. Chicago has a midrange cost of living, as far as cities go. You can have a nice life and afford favorite activities, whether that’s travel or boutique workouts. Unlike living in New York or San Francisco, you probably aren’t putting most of your paycheck toward rent, either. Chicago has a big public transportation network, so many residents use public transit to commute to work. Car owners take heed: The city requires that you purchase a special vehicle sticker, which costs $87.82 for passenger cars, within 30 days of moving to Chicago. Parking can be a premium, too, so you might want to search for an apartment that includes a parking spot. Food is fairly inexpensive in Chicago. When you’re in the mood to celebrate, you can easily find fine dining restaurants where you can treat yourself. On days when you need something quick, the city’s wide array of ethnic foods, street carts, fast casual chains, and delivery services can keep you nourished for $15 or less. As in any city, real estate varies widely by Chicago neighborhoods. Renters are scooping up luxury apartments in these 11 neighborhoods, which means if you spot a great apartment, you had better apply before another hopeful tenant takes it! Once you decide what neighborhoods appeal to you, jot down a few must-haves in terms of features. Maybe you need a pet-friendly place, or perhaps you are seeking an apartment with an on-site fitness center. Decide how far you’re willing to live from public transit. While you can find a place to live last minute, you’ll see the widest variety of properties if you start apartment hunting 45 days before you want to begin your lease. Most tenants in Chicago give a two-month notice, which means property managers start advertising rentals within 45 to 50 days. Demand is high in Chicago, so any great apartment will get a lot of interest. If a place meets most of your criteria and you like the look and feel of it, go for it. As a shortcut to the perfect Chicago apartment, consider working with a full-service real estate company that offers luxury apartments in your preferred Chicago neighborhood. Working with a company means you don’t have to attend open houses or stroll the streets in search of “apartment for rent” signs. Instead, view apartments online, see photos and sometimes video footage, and reduce the research time associated with finding the right fit. Mo2 Properties offers beautiful apartments in the best neighborhoods for Chicago renters, as well as property management services and real estate services for landlords. Let us help you find your dream rental. Contact us today.